It’s probably not the timepieces themselves that tie Chronopassion to Panerai. The relationship is closer and stronger than that. Laurent Picciotto goes so far as to describe it as “magical”. Perhaps the truth is more to do with the eternally ‘outsider’ character of the Italian brand – and of Chronopassion's founder. There is also the detail of their shared origins as passionate retailers. Indeed, it’s a little-known fact that both the Panerai brand and its founder, Giovanni, were first and foremost in the business of watch and watchmaking tool sales and repairs. As early as 1850, Giovanni Panerai had made his name as a watchmaker in his native city of Florence. His son, Leon Fracesco, transformed his father's occupation into a flourishing business: in 1907, 50,000 copies of his watch and timepiece catalogue were published! What was then known as Orologeria Svizzera sold Rolex, Longines, Vacheron & Constantin, Movado, Patek Philippe and other brands. A new century opened a new chapter: the brand supplied the Defence Ministry with its first precision optical instruments. In 1910, the first experiments on luminous materials began and a system for making instrument dials glow in the dark was perfected. Luminescence was produced using a mixture of zinc sulphide and radium bromide, later known as Radiomir. The road ahead became clear: Panerai already sold movements, and simply had to combine this skill with its recently acquired expertise in dials to create its first watch – a feat that was achieved in 1935. One amusing aspect of this tale is that the first Panerais were driven by a Rolex movement. The Italian army was of course the first client. This was in 1937 – and the virtual monopoly of the military for Panerai watches continued until 1993 ! Did love at first sight lead to overnight success? “Far from it!” laughs Laurent Picciotto. “I sold barely a dozen pieces a year, mainly Mare Nostrums (ed: the original chronograph from 1943, which was still at the prototype stage for historic reasons). History has led to these timepieces now being among the most prized collectors’ items,” he says with a wry smile. This apparent lack of demand did not dent Chronopassion's belief in Panerai, however. The Vendôme Luxury group, later known as Richemont, apparently had a similar instinct, too: it bought out the brand in 1997. 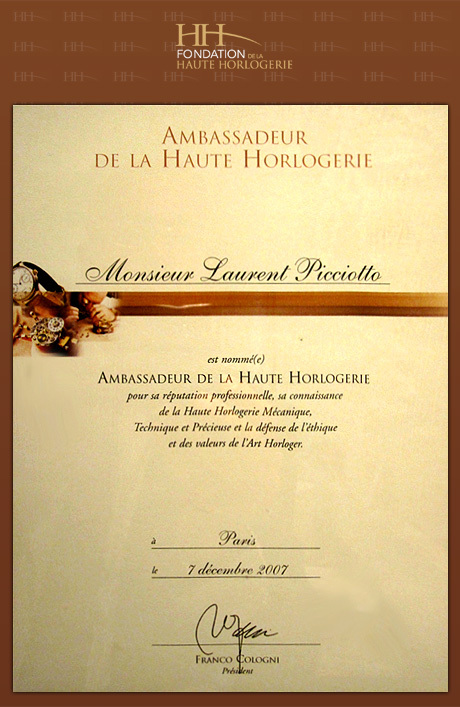 The group lost no time in using its resources to raise the profile of Panerai. A series of 1000 timepieces were offered on the Italian market – and were snapped up immediately. A distribution network was established. “There were twelve of us retailers at the first meeting. Eleven of them had never sold a Panerai timepiece before. I was the only one who had,” recalls Laurent Picciotto. At this point the story could have taken a commercial turn, with success guaranteed. However Panerai once again showed it was different: demand was driven by the brand's fans, known as paneristis. According to Laurent Picciotto, they are characterised by “acute collectionitis” – and his sales increased 25-fold. “It was an internal explosion. Completely unprecedented,” he now admits. Magical is indeed the word.